And on the first day of Christmas… the people of Tasmania wanted to know what do for the other thirty days! Ho, ho, ho; suddenly it’s December! While we all scratch our heads and wonder how 2018 has gone so fast, peruse at your leisure to see all the fabulous things happening in Tasmania this December. To celebrate their third album release, Lo La Ru, The Rubens are coming to you, Launceston. They will be joined at all headline shows by musical group Little May with an additional opening support act in each state to be announced via a triple j unearthed competition. Returning this year, after 10 years of the Niche Markets, is a two day event, Niche-Mas. Described as a ‘European style, artisan-made Christmas experience,’ Niche Market is one of the most successful design and make enterprises, attracting more than 5000 people, only this time with a little Christmas twist. Santa’s Funland is coming to the Derwent Entertainment Centre teeming with Christmas everything. Think unlimited rides for the whole family, a magical winter forest (with falling snow), face-painting at the elves workshop and why not stop and visit Frosty the Snowman! Tickets include all activities for free. No plans thus far for Christmas, or simply not up to the idea of cooking for who knows how many people? The Tailrace Cafe has you covered. Open on Christmas Day and offering a delicious spread that Chef Kelvin Bowers worked hard at creating. The kid’s will be happy too as the kid’s playground, Kids Paradise, is open for free to guests. Devonport’s family friendly New Year’s Eve event, Skyfire, is on again this year, running from 6pm to midnight at Roundhouse Park. Come for a fun-filled night with free entry, activities and fireworks to welcome the New Year. Every year, the Sydney to Hobart Yacht Race draws in massive coverage and support from the nation, eager to see who will win. 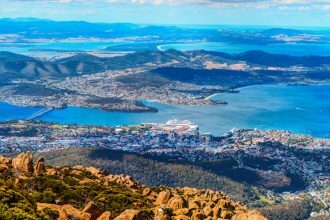 This year will be no different, and while the yachts race why not go to the Hobart Race Village, which will be alive with festivities and fun, on the 27 of December and 01 January, to see the boats in. This December has something for everyone, including the much awaited Falls Festival. The lineup this year is exciting, with artists including Hilltop Hoods, Vance Joy, Amy Shark, DMA’s and Hayden James. If music and good times are your thing, then kick off 2019 with a bang. The Taste of Tasmania is a festival celebrating food, beverages, good times and family fun. The tradition was started in 1988 for crews finishing the Sydney to Hobart yacht race. Being the largest festival of it’s kind in Australia and located on the beautiful waterfront, why wouldn’t you want to come and visit? Free entry, however there are tickets available for purchase for the masterclasses.